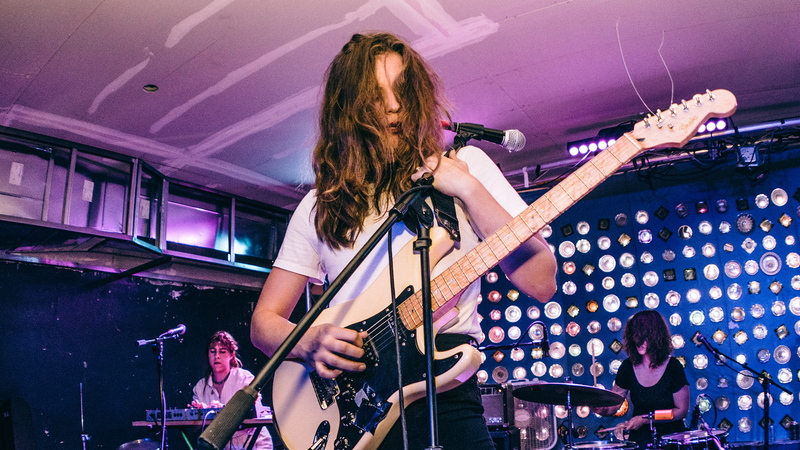 When spunky Tennessee punk band NOTS decided to take their tour to Baby’s All Right in Brooklyn for an intimate, yet energy-packed show supporting the release of their sophomore album, Cosmetic, there was no way that we were going to pass on the opportunity. The quartet—Natalie Hoffmann (guitar/vocals), Alexandra Eastburn (synth), Charlotte Watson (drums), and Meredith Lones (bass)—served up a sizzling performance full of angst-y vocals and garage-infused instrumentals, forming a concoction that is the unique, aggressive alt rock sound by the Memphis-bred band that we’ve come to know and obsess over. The “Reactor” creators were joined by openers, The Meltaways, a local punk three-piece who just recently released a seven inch after putting out their self titled debut this past summer. The World closed out the opening sets without failing to keep the energy on full blast leading up to the madness of the main event. The combination of all three resulted in a party at the front of the stage, making for the best time we've had all week. Check out our slideshow of photos from the show on October 11 to see what a live set from these awesome emerging artists is like IRL. If you like what you see, be sure to track them all on Bandsintown to find out when they’ll be performing at venue near you!